During the first year of No Man's Sky's development, not even half of the Hello Games studio knew what a team of their four developers were working on. 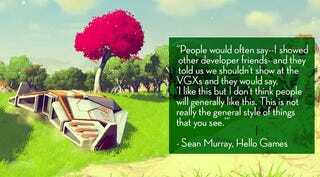 I spoke to Sean Murray, managing director and Hello Games founder, in an interview at E3 in Los Angeles two weeks ago when he told me this story. "We worked for a year and we didn't actually show anyone," he said. "There's like ten people at Hello Games and four of us just went into a room and locked the door and we had a separate entrance and things like that. We didn't show the rest of the team for that whole year and we also didn't show any publishers or anything like that." The small indie team at Hello Games is still set to self-publish its impressive-looking first-person game. Murray: "We worked for a year and we didn't actually show anyone." "Why didn't you show the rest of your team?" I asked. "To build pressure and expectation," Murray said. "I wanted it to go back to what we felt when we were making Joe Danger and what I felt when I was working at other studios on prototype games. I wanted to feel the guilt of wasting time or something not working, that pressure. People, the rest of the team, were working really hard on stuff that was important for Hello Games and Joe Danger-related stuff. So I felt enormously guilty if I wasn't delivering. That's how you should feel, I think. Also this thing of, 'I have to impress them.' We kept saying 'it's not ready, it's not ready, it's not ready.' The longer that went on the more that we wanted to make it good. We needed to justify the amount of time we'd spent on it. So that's quite nice." "How was the reaction when you finally showed the team?" I asked. "It was cool," Murray replied. "Some of the team did have those questions, like, how are you going to do this? This is madness, and stuff." The team was impressed, Murray told me, but they weren't exactly sure what to make of it, either. And they weren't the only ones a little taken aback by their first look at the game that would go on to steal the show at last year's VGX. "There was also something which we had before when we showed it off at the VGXs," Murray said. "People would often say—I showed other developer friends—and they told us we shouldn't show at the VGXs and they would say, 'I like this but I don't think people will generally like this. This is not really the general style of things that you see.'" Murray: "Some of the team did have those questions, like, how are you going to do this? This is madness, and stuff." Even Murray himself, who was surprised by the amount of cheering a game like Mortal Kombat X received during its showing at Sony's press conference, wasn't sure that people would accept his game. "Why was Mortal Kombat getting so much cheering? That is a gross game to me," Murray said. "And it's kind of embarrassing. I sat there cringing a little bit. There's a lot of that and when you see that you think, 'Ok I like this thing [No Man's Sky], but I don't think that crowd is going to like that thing.'" But excitement for No Man's Sky at its VGX reveal turned out to be high. It was a new game with seemingly endless possibilities. The player character wandered a colorful planet and then instantly jumped into a spacecraft to fly straight into space combat. And there was cheering. Word on the Internet was that everyone was excited. The buzz for No Man's Sky was even louder at its recent, second showing at E3. Hello Games had not only reinforced all the ideas that made the game so appealing in the first place, but this was now a survival story. Just roughly five months previous to E3, their studio had flooded. And badly. "We basically threw out everything," Murray said. "We lost all our machines. We had most of the work backed up. We told people at the time that we had everything backed up, but the reality is we didn't and we lost some stuff and so, for us, this E3 is more triumphant than people realize." Although they had promised that the flood would not delay the game, some gamers were apparently unconvinced. "Every now and then, people would be tweeting—because I'm NoMansSky and people just use it—so they'll be like, '@NoMansSky was flooded! They'll never be at E3!' and stuff like that," Murray said. "Everyone was talking about it and saying, 'I think that game was vaporware!' So we felt, not that we had to prove people wrong, but we just had to regain people's faith for them to be ok and for ourselves, as well." Five months later and, what do you know, they showed up at E3, post-flood and all. And, don't worry. Murray tells me they really do have everything backed up now. It only takes one bad hit to learn that lesson.